ERP solutions are a large investment for your business, there’s no getting around that. However, we know the benefits of using an ERP solution and they are definitely a worthwhile investment. 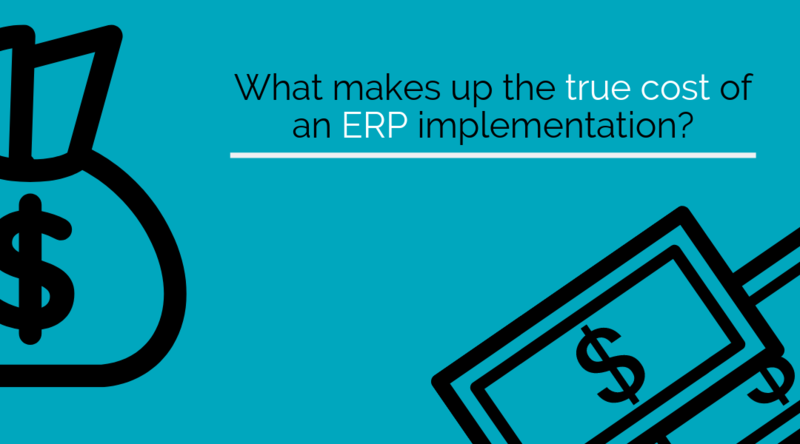 What we’ve seen previously is people confused about how ERP implementations are quoted and priced. You may look into the license cost for the ERP of your choice and think it ends there, but unfortunately not. As an ERP implementation is a large project that is going to affect your whole business, there are going to be a few other ‘hidden’ costs that make up the full total cost of ownership of the solution. This blog post aims to clear up any confusion you may be having about the various costs that are involved in implementing an ERP solution to help you know where the investment is going. Licenses will be a large part of your overall implementation costs. Licenses are required to get access to the ERP, usually you will need a license for each user that will be using the solution. As licenses often cost thousands of pounds when purchased perpetually, subscription licenses have been made available to help spread the cost and pay a smaller fee each month for each user accessing the solution, rather than purchasing the licenses one-off at a higher cost. Subscriptions offer a little more flexibility as you can add & remove licenses whenever you need, and it will just affect the monthly cost. If you purchase licenses perpetually there’s no way of removing them, you can just add more if necessary. There are three main ways you can deploy your ERP solution; on-premises, in the cloud, or Software as a Service (SaaS). Different deployments each have their own advantages and disadvantages, as well as different price points. On-premises hosting is done on your own servers, if you don’t have the hardware in place already it can be another expensive investment for your business. Hosting through a cloud service provider (CSP) such as Microsoft Azure, uses their servers and you simply pay a monthly subscription, around £40 per user/month, to use the service. Cloud hosting offers more flexibility than on-premises as you’re not restricted to the hardware’s limitations and can simply buy more bandwidth or storage when required. Some ERP solutions can also be deployed using a SaaS deployment, this is when both the hosting and licensing are included under one price, usually listed as per user/month. SaaS deployments are often quite quick and easy to get up and running as you’re simply purchasing a login for the solution and everything is handled for you. Depending on your business requirements, you may require some customisations to your ERP solution to ensure it will run all your business processes effectively. Customisations can take time and effort to create, this will lead to higher costs as time is money. Something to check before implementing your ERP is whether it already has all the functionality you require as standard, or, the amount of time & effort that will be required to create the customisations. The process of implementing the ERP into your businesses pre-existing infrastructure will take time, making it another cost to be included. It’s essential to make sure the ERP system is installed and configured correctly to ensure it runs efficiently and works with the software and processes that you already have in place. ERP solutions are complex and there can be a steep learning curve, making training an essential part of the ERP implementation—because what’s the point spending all this money if none of your employees know how to use it? Depending on how many users and the scope of the training costs will increase, but the productivity and efficiency gained from completing the training rather than leaving employees to learn for themselves will make up for the costs. Once the ERP system has been implemented, chances are that not everything will be perfect straight away—this is where support costs come in. Support from your ERP provider is there to help with any issues or problems that you are facing. This will obviously take time from the vendor, making it another cost to add to the list. Some ERP vendors charge a set monthly fee for support which can be useful in the early stages after implementing the ERP, but costly once they’re not using a lot of support a few months down the line. At Mercurius we have Pay As You Go support available from £55/hour, ensuring you only have to pay for the support you use. Creators of the ERP software (Microsoft, SAP, Sage, etc.) will also often have an annual maintenance fee which is paid directly to them in order to support updates, bug fixes and changes to the ERP solution. This yearly cost is usually between 10-20% of your overall license costs. For Microsoft, their annual maintenance, or BREP (Business Ready Enhancement Plan) is set at 14% of your overall license costs. We hope this blog post has helped break down the various costs that are involved in implementing an ERP solution to your business. If you’re searching for the perfect ERP for your business, have a look at our top 5 here. Alternatively, if you’ve already decided that Microsoft Dynamics 365 Business Central is the right one for you, please get in touch with us for a no obligation chat about your requirements.